Tuesday afternoon Co.’s 46, 50, and Riddle EMS were dispatched to the 600-blk of Darlington Rd for an accident. 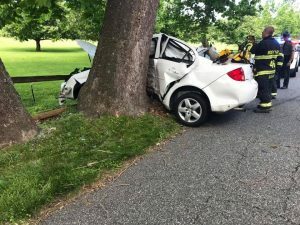 MICU104 arrived to find one vehicle into a tree with one subject confined. TA46 popped one door to gain access. 50 assisted with controlling hazards and patient packaging. Squad 50 and Engine 50 made the response from Station 50. Chief 46 had the Darlington Rd Command.